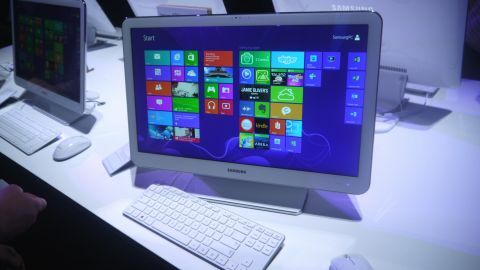 Samsung has drawn back the curtain to reveal the curiously named ATIV One 5 Style, a 21.5-inch all-in-one PC. At first glance, the Style resembles what might emerge if you placed Apple's smaller iMac and a Galaxy Tab in one of the Telepods from The Fly. Rather than a freakish mutation, however, this machine takes the former's compact and minimalistic design with the latter's smooth plastic shell to create something curiously attractive. While not quite as slim as the latest iMac models (but likely to be more affordable), the Style makes an admirable attempt at holding back the bulk, measuring 26.9mm at its thickest point. Picking the 5.9Kg machine up, it posesses a solid, weighty feel that belies its lightweight appearance. And an accidental swing of the arm wouldn't be likely to knock it over, thanks to its backwards protruding base. Built for Windows 8 with a 1920x1080 pixel resolution touch-sensitive display, the Style can run fully fledged desktop programs in addition to apps downloaded from the Windows Store. The panel produced bold colours and decent viewing angles, verifying Samsung's claim that the machine would make a suitable media hub. Bending the monitor back allowed some variation in angles, though it didn't extend quite as fully as we'd have hoped. The ATIV One 5 Style houses an AMD A6 Quad Core Processor with a shared graphics chip and 4GB RAM. While those specs aren't going to set the world on fire, it should prove adequate for the average home or office user, and the desktop was nippy and responsive when we pawed our way through the OS. The Style features a row of ports located at the rear centre of the machine, including two USB 3.0 ports, two USB 2.0 ports and a 3-in-1 card reader. Additionally, an HDMI port allows users to connect a Blu-ray player or games console to use the Style as a monitor. A concealed SD card slot, revealed with a light press of the finger, is located near the edge at the back. We weren't expecting the Style's 720p webcam to be crystal clear, but we were slightly disappointed with the level of pixellation after switching to full screen. It should be adequate for casual Skype sessions with friends or colleagues, but those looking for greater clarity in their video calls would need to invest in a higher resolution camera. The Style is set to ship with a wired keyboard and wireless mouse that feature a design consistent with the machine and the company's Galaxy range of products. While the keyboard was fairly Mac-like, we prefer the snug and ergonomic feel of the Style's mouse to Apple's equivalent. The ATIV One 5 Style will be available to buy in the UK later this year.